Washington (CNN) – Former President Bill Clinton is not known for being detached from big decisions. But when it comes to whether his wife will run for the White House in 2016, the former president said he would play a small role. "Like I said, I'm a bit player," Bill Clinton told the Denver Post on Monday, "and whatever she wants to do is fine with me." Hillary Clinton, who is in the middle of her nationwide book tour, is admittedly considering a run at the presidency and has said that she will likely announce her decision in 2015. Bill Clinton, who successfully ran for president in 1992 and then reelection in 1996, is regularly asked about the prospect of moving back into the White House. Earlier this month he said, "I don’t think about it, but I’m for whatever Hillary wants." Despite Bill Clinton saying he would be a non-factor in the decision, Hillary Clinton writes in her new memoir "Hard Choices” that she and her husband took a long walk and talked about the prospect of another presidential race. "Recently, Bill and I took another of our long walks, this time with our three dogs, near our home," Clinton wrote in the book's final passage. "We both know I have a big decision in front of me." She added, "But for this day, at least, I just wanted to stretch my legs and enjoy the spring. Everywhere around me there was new life. There have been too few quiet moments like this over the years. And I want to savor them. The time for another hard choice will come soon enough." Bill Clinton has been critical of the length of presidential campaigning and regularly mentions that when he first ran for president, he didn't declare until 13 months before the general election. 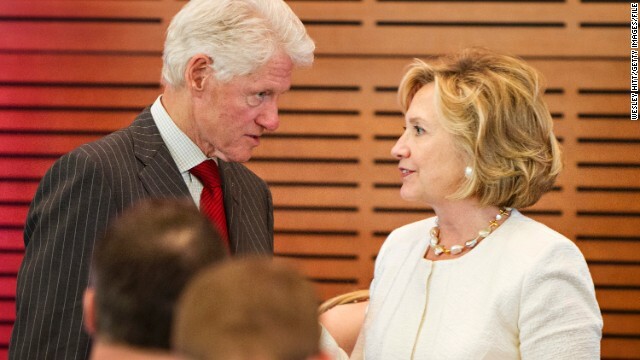 Late in 2013, Bill Clinton told CNN Español Anchor Juan Carlos López that he didn't know whether Clinton would run in 2016, but did add that he thinks and Hillary Clinton believes that "the country should spend at least another year working very hard on the problems we have." That said, Hillary Clinton's book tour has looked a lot like a campaign and she has been more open to answering questions about 2016. She has also weighed in on the prospect of moving back into the White House and what Bill Clinton would be called if she were to win in 2016. "If that were to ever come to pass," Hillary Clinton told ABC about the title "First Mate, "that is a pretty good title." The Clintons are in Colorado for their annual Clinton Global Initiative America conference and Bill Clinton sat down with the Denver newspaper after touring a touring a health center project aimed at helping homeless and vulnerable populations. Gosh, but it's great to catch up with you again. Hope all is going well in your neck of the woods. Things here are fine. Three of the grandchildren are touring Europe with their Mom, Dad, and paternal grandparents. The other is at summer camp with her youth group. I've gotta say ... its been very, very quiet. The rain you mentioned in your earlier post? It's more south of us. We've had enough ... but not too much. Anyway, enough personal stuff ... yes? And you as well my friend! It appears that being away from my one of my favorite hang-out places, and my not so well kept guilty secret (this site) has recharged me. On the occasions when I can "jump the fence" and contribute to the conversation I don't find myself hemmed in by an almost intimate knowledge of the "players" but rather propelled to make the best of the little time I have by calling a spade a spade.....or a Republican a Rethuglikkklan (wink!) as the case may be. Either way it is always fun to escape the warden here at work and talk some smack with guys about things that we can only truly change if we get up from our computers or go to a different forum. Be well. Be safe my friend.